NEW YORK (March 25, 2019)--Two highly regarded members of the Split-T Management stable scored wins on Saturday night at The Hanger in Costa Mesa, California. 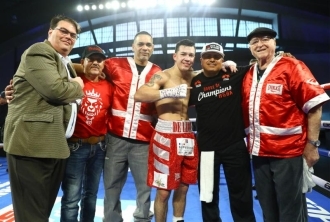 DeLeon remained undefeated by stopping Jose Luis Gallegos in round six of their scheduled eight-round junior lightweight bout. DeLeon dominated the first four rounds by landing hard body shots that started to break Gallegos down. Gallegos dropped DeLeon in round five with a hard right hand off the ropes. That was short lived as DeLeon regrouped very nicely and started attacking Gallegos and began to hurt him with a flurry of punches that forced the referee to stop the fight at 1:35 of round six. DeLeon was a three-time (2009-2011) National Golden Gloves champion as well as a Ringside World champion in 2008 and 2008 National Silver Gloves champion. DeLeon, 131 1/2 lbs of Detroit is now 19-0-1 with 11 knockouts. Gallegos, 131 1/2 lbs of La Barca. MX, and has defeated undefeated fighters before, is 16-6. Puente, Puente of Vista, California by way of Sinaloa, Mexico won a four-round unanimous decision over Alejandro Lopez. Puente boxed very well, and raised his record to 2-0 with the unanimous decision by scores of 40-36 twice, and 39-37. Puente won the 2016 National Youth Open Championship, and was a member of Team USA. Puente was a favorite to be a member of the 2020 United States Olympic Team. DeLeon and Puente and promoted by Top Rank.